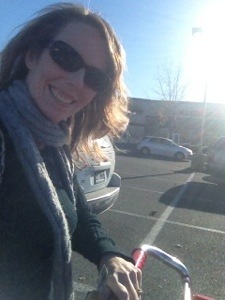 Today’s Random Act of Kindness was an easy task, but one rarely acknowledged or even noticed by others. As I was walking to my car today after a quick shopping trip at Target, I glanced across the parking lot searching for my van and voila… Not my van, but a perfect opportunity to bless someone else! 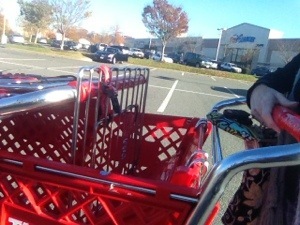 Yes, the infamous lazy man’s cart just sitting there hogging up a parking space. 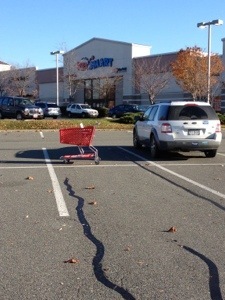 The irony here is that the parking lot was near empty – not like the owner of the cart had to fight through lanes and lanes of cars to get the cart back to a safe place! I actually started laughing when I saw this, because a friend of mine, Sheri, had just this week shared how she always puts unwanted carts back where they belong. I told her that she inspired me to add this to my RAK list for Black Friday, not knowing that an opportunity would present itself just a few days later! So instead of turning a blind eye (“It’s not MY cart!”) I did the right thing and retrieved it, then returned it (in addition to my cart). Be sure to check back on the blog Friday afternoon through Saturday as I am SURE I will have several Random Acts of Kindness to post from Black Friday shopping. I’m almost giddy thinking about my surprise plans! I wish you all peace and joy as you go about your travels and special plans for Thanksgiving. Be blessed and pay it forward! 1 Response to "Random Act of Kindness #31"